In many respects, Alan Wake reminds of a typical postmodernist text: it draws on various sources, integrates other texts into its textual body, and is highly self-conscious both about its construction and the recipient's role in generating meaning. However, Alan Wake is not a postmodernist novel, but a video game. 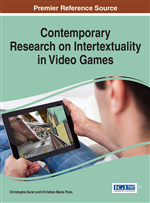 This chapter explores the ways in which this video game incorporates other cultural artifacts and argues that its cannibalistic incorporation of other media transforms Alan Wake's textual body into the game text's true, Gothic monster. After its release in the spring of 2010, Alan Wake’s story was nearly unanimously celebrated for its innovativeness and complexity. This story centers on the eponymous popular crime fiction, thriller, and horror author suffering from writer’s block, who soon discovers that the events unfolding in front of his very eyes are lifted from his yet-to-be-finished (or so he thinks) novel Departure. However, Alan and the player soon come to understand that the majority of Departure has, in fact, been written. The only problem is that Alan cannot remember composing it, for he suffers from a week-long memory gap following his wife’s abduction by what at first seems to be a kidnapper but soon turns out to be a dark force that needs a writer in order to be created. In the course of the game, Alan and the player learn that the events in the Pacific Northwestern town of Bright Falls are, in fact, predetermined by Alan’s writing. However, this narrative layer is framed by another one, for the game text suggests that Alan-the-writer is nothing but a character in a story authored by Thomas Zane, who repeatedly appears as a God-like narrator figure in the gameworld and metaleptically transgresses diegetic levels. The confusion between and conflation of different storyworlds (and storyworlds-within-storyworlds) extends to a confusion between and conflation of temporal levels, as the past constantly interrupts the present, which, at the end of the day, has already been written.1 In short, Alan Wake presents a very intricate story for any medium, and not just for a video game. Whereas numerous critics commended Alan Wake’s narrative, others considered its evident emphasis on telling a story exemplary of narrative-based video games’ neglect of gameplay, which turned out to be rather simplistic and repetitive. While there is some truth to the criticism, I would argue that this assessment reveals a misunderstanding between the developers and critics (and, possibly, players). To be sure, the critique of Alan Wake’s apparent prioritization of narrative over gameplay draws on video games’ primacy of “participatory interactivity” (Schulzke, 2013), on which scholars such as Markku Eskelinen have elaborated, arguing that “the dominant user function in literature, theatre and film is interpretative, but in games it is the configurative one” (Eskelinen, 2001). In contradistinction, Alan Wake emphasizes what Marcus Schulzke (2013) has called “interpretive interactivity,” for the game’s linear gameplay, which is constantly interrupted by non-linear narrative sequences, assumes a key role in the intertextual games that Alan Wake plays, as the repetitive gameplay taps into a central convention of the Gothic, while its linear design metaludically highlights the role agency plays in the game. In the course of this essay, I will thus suggest that Alan Wake’s monotonous gameplay supports the game text’s meaning, as it is merely one element in the video game’s self-reflexive engagement with its role in the Gothic tradition and its meta-reflections on the medium of the video game in view of other media. Indeed, Alan Wake’s metatextual incorporation of other media repeatedly produces uncanny effects, thus reinforcing its position within the Gothic tradition. Yet beyond remediating “haunted media” (Sconce, 2000) for their Gothic effects, Alan Wake’s apparently limitless text, I will argue, eventually emerges as the game text’s defining monster.